Whether the movie is American, Indian or Pakistani, they all have showed us many scenes which defied all the laws of physics, but we enjoyed them even though we did not got to say that this could happen in real life. But there are scenes where one would imagine how would it look in real life without the aides profession stunt men use to shoot an action scene for a movie. 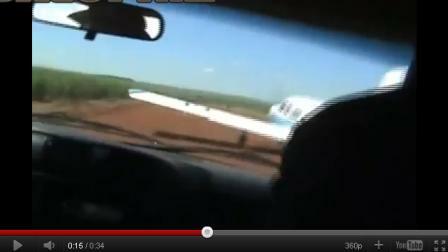 This is one of such scenes, where a Brazilian cop decides to stop a plane by using his car. According to Brazilian news website, this Federal Police officer prevented a plane to take off which was smuggling 150,000 US $ worth of stolen electronic items and a bicycle. The smuggled goods were stolen in Paraguay and than brought into Brazil to be sold here but someone tipped off this Federal Police officer who went Die Hard style against the plane, stopped it, arrested five smugglers and seized goods worth 150,000 $ in a style his boss will be telling his boss and so on so forth.